Eszer brought her son, Gili brought Sagi I believe. From the group chatter I thought there was going to be one more person. Once again, I ended up playing a color I was not expecting to, which made me regret several of my draft choices. I had a few R direct damage and some basic red creatures, but my W had some fliers and game enders. Also, I was already playing BG, and I had an artifact that gave BGW mana. My casting costs were pretty low and my card power was medium. I didn’t have anything very strong, which made me worried. David had some strong creatures and most were fliers, but he only played with 10 creatures. In the first game he picked ok but I was able to take him out. In the second game he just didn’t pick any mana. This was played early in the evening by some people, and then later several times by Nadine and David. Nadine toasted David, as you can see. Nadine doesn’t like the Batman themed art. She won with the Baron’s card 6 or 7 times. I taught this is a filler game to Nadine and David. Nadine doesn’t like abstracts, so she didn’t try much. I learned that putting your best stone as the first stone in an octagon is not necessarily the best play, since other stones placed on top later (even your own) will sink it. David apparently figured this out before I did and so ended with the higher score. This game is far better with three players than with two, and may even be better with four. More players give you more room for strategy and interesting tactical play. These four are players who favor thematic games, so they joined to play one of Binyamin’s new arrivals. It is a cooperative game with a potential traitor. There was no traitor, and they all won. The game includes electronic instructions, like a VCR/DVD game. I think they all had a good time. First play for Sagi, I gather. The scores were something like 7/7/7 at one point. I believe that Nisan won by stealing Largest Army and Longest Road in one play. The last time we played this, David made an early mistake but was sure he could do better. He always beats himself up when making a mistake (even after taking a long time to think about it), forgetting that everyone else is also making mistakes and probably not even smart enough to realize it. In the end, he is very good at these kinds of games. Nadine wasn’t sure if she wanted to play again, but she admits the game is good. Like last game, I spent most of my time off in a corner, so Nadine fed David some extra points by using his tracks. Maybe the center really is the better location. Hard to tell. It’s possible that the game is 1 or 2 rounds too long with three players. There are still things to do, but the scoring positions of the players never seem to change in these rounds. First play for Binyamin, and a reminder of the rules for Eszter. Eszter and I both passed 20 on the same round, but she had the extra point. Our twists were a) cycle all cards in hand after each build, and b) use the previous invention’s effects when playing an invention without effects. Attended: Nadine, Aaron, Schneur, Haim, David, Ben, Jon, Oshrat, Lior, Francis, Helen. Oshrat had been in touch with Gili, she brought Lior. Jon called at 8:45 and was surprised that we hadn’t started any games yet, so we waited for him for PR. Bon Voyage to Jon’s daughter, and Ben’s niece, Tal, who is off to a semester in Germany. I taught Aaron and Schneur, Schneur won our first two games. Haim joined in, he had played before and did well. When David came I let him take my place because I wasn’t doing well, David and Aaron both won some rounds. They all liked playing. I taught this while we were waiting for more people to arrive, new to all three of them – Aaron had played once but didn’t remember too much. They really liked the game. Ben was behind but got a Monument giving him 22 points. Then I taught Settlers, Oshrat had played before. Helen left early so Jon played for her for a few turns, but then left to play Tichu. They did well at catching onto how to play, and enjoyed the game. Thank you to the players who remembered to move my table back. David taught this to Schneur while I was teaching Settlers, and we played a few practice rounds. Before we started I said Schneur as the new player should get corn, which led to a discussion of which starting positions are strongest, Jon said fourth then third, which were the positions David and Schneur played. Jon and David had Factories, but were each surprised when they were ready to build that the cost was 8, even though David had set it up that way. I made one bad mistake, not trading which would have let me buy a big building, and I didn’t play so well in general. David and Schneur had two large buildings, I had one. Jon took a Wharf instead of a large building, which seems to not have been worth it. When he was discussing that whether it was a good move or not depended on how long the game lasted, I didn’t realize that he knew he wasn’t going to get a large building. But he had 5 corn, and crafted and shipped at least 4 times. I was on his right, so barely got to ship anything from his crafts. It was fun to play, we haven’t played in person or online in ages because the site we played on crashed, and it’s not on Yucata. We didn’t calculate the exact score on the last hand, David made a Tichu. First play for Schneur, who liked it and did well. We all had mainly bad hands, no grand tichus, one bomb. David called Tichu on the first hand and made it easily in two hands. I got the Phoenix a lot and always passed it to David, even when I had the Dragon. Except once, while trying to decide which to pass to David, I realized that I should maybe keep them both and call Tichu myself, so I passed him the Dog. My hand wasn’t that good otherwise, I didn’t really have entries, but I called Tichu because I had given him the Dog. I ended up making it somehow, Jon didn’t have a good hand to block with and kept letting me get rid of low cards. David and I were very lucky a few other times and both went out first, with bad or medium hands, but the opponents had worse hands. At one point David won a trick with a 3 over a 2. On the last hand Schneur bombed David’s straight after David had called Tichu, leaving David with one card, and Schneur with three. I was able to get the lead, feeling bad that I didn’t have the Dog. I played a low single card, but since it was passing through Schneur who played high, I didn’t expect it to work, but David had the Dragon. I don’t think I made any mistakes, it’s been a while. Of course luck helps. We tried Jonathan’s prototype word game, which is pretty good, but not my style. He is still refining the game, and hopefully it will find a home one day. First play for Jonathan. Nisan and Gili are very experienced, but likely haven’t played in a while. First play for Alan. Nadine thinks she doesn’t like the game, but then she thinks she does but that it’s just hard. It is hard, but – though it has planning that involves points and money, it doesn’t seem to bog down in long calculations of numbers. The calculations are more about resources and how far an opponent is willing to bid. I really like it, even though I win it often. I try to do the same thing each time, but I always end up doing something very different. This time I took up to 7 debts, paying off only 3 by the end. The amount of points I made with the buildings was enough to balance it out. Alan ended with the most buildings, and David had the biggest point burst in the last rounds, but not enough. First actual play for Alan, I stood behind him and gave him advice, often very specific, sometimes very general. I let him play on his own for a few hands. We opened the evening with a hand that had four bombs. Other hands after that had multiple bombs. Nisan called grand tichu at least six times. The first time he made it. After that his team took a drubbing. Alan/I even called and made tichu against his grand tichu. Three times when David realized that his teammate couldn’t make grand tichu, and we had called tichu as well, he simply bit the bullet and went out first. At one point the score was 915 to -415. Then they caught up 800 points in two hands, and our team began edging slowly down in points, from 915 to 890 to 825. Finally we went ahead again to 960. They won another 400 points bringing them to 340, but we finally ended the game after 15 hands. I thought we’d have light attendance due to vacations, but we had a good crowd in the end. Emily and Eitan brought Itai, a fellow student, Jewish Philosophy and Law. OK, also Spain. Nobody understands why I win so often, I don’t really either though I do have a lot of experience now. I played high cards at the beginning to take the king and special scoring, but the others also took those. I did have some regions to myself for some reason. It was Itai’s first play, he did very well, and he’s not an experienced board gamer, he caught onto the strategy and started off strong. But he and Emily fought over his Grande region, Granada, ending with over 20 cubes there between them, and both their Grandes. I blocked him once because I didn’t want him to score high in two regions, he had the eight scoreboard in Granada, but I didn’t realize Emily already had more than he did there. The game was close except for me. Emily planned well for a Lose all your guys from one region card, it hurt Itai and Eitan because they had to pick a region with at least 3 guys. The board picture is from the 8th round, they had a hard time figuring out ways to attack me (blue). Eitan Castillo’d in to tie me in my Grande region, Aragon, and Itai moved the king in when we were tied on the last round, with the 4-0-0 mobile scoreboard. Neither of us scored and no one got the king. It was the ‘move the king to an adjacent region’ which tends to show up on the last round. We skipped 3 cards at the end – Veto, Clear your court, and Take back a Power Card. Gili brought and taught this. At first they thought Sara won, but then Josh found some more points. I taught this, Emily and Eitan had played a long time ago. I haven’t played in a while either. I wasn’t ahead but was the only one on Notre Dame one round, netting 11 points. I had the extra point from early on, Emily and Itai did too though Itai lost it at the end. I didn’t have a lot of cubes or money. Eitan had a lot of money, last round he and Emily both had two cubes in Notre Dame. Itai used the point strategy effectively, with 5 cubes in that sector. Eitan got a lot of points for not having the extra point thing. Itai did well with the rats, the rest of went over once, Eitan and I twice. 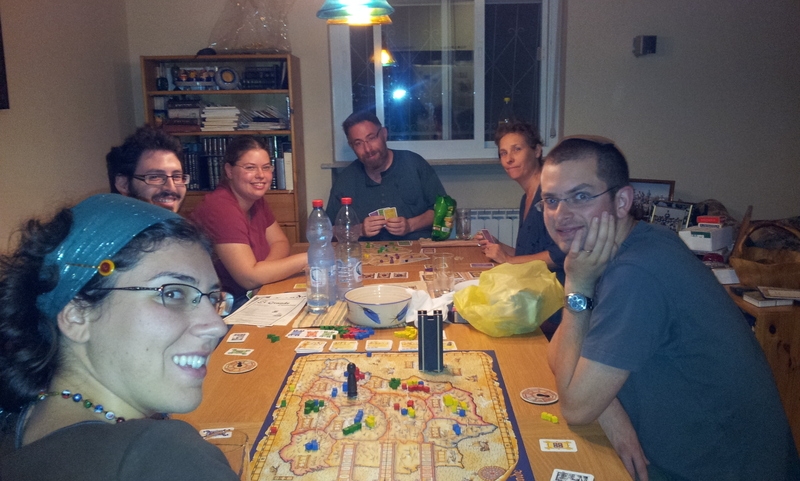 Last week at Gili’s – Emily came in first, Eitan second in Egizia with Elisheva and Gili; Lotem won against Asif, Nina and Shlomo in Settlers. Three weeks ago at Gili’s with six players – Taj Mahal, Castle Panic twice, The De Vinci Code, Kingsburger, and Dominion. Emily and Eitan got this game last week and played it once, which helped them. Gili was hit by a card misinterpretation which lost her a lot of points. This is a complex and interesting strategy game with a lot to consider, and explore. I took the fewest turns which didn’t help me enough. It takes a while to understand the mechanics, scoring, cards and options. Emily got a Distillery right away and used it well. Gili brought over my new games, yay! We didn’t want to learn the rules to a new game from scratch, but figured it would work with a party game. We played more seriously than it seems to expect. You get words and give three word clues to get the others to guess, with required start words. There is a two-minute sand timer. It took each of us at least two minutes just to think up our first set of clues. We did make it harder by requiring the required word to be used first instead of anywhere in the phrase. And we didn’t use the timer. Because Eszter wasn’t sure of the meaning of a word, Gili introduced us to a distracting cool phone app, Camdictionary, that reads and translates words in images. Emily got the most cards for guessing. Gili did the best at having her word used in the next clue phrase, which gives no points but was impressive. The game is fun but challenging, but we didn’t really see how it’s a party game. Gili hosted while I was away. Apparently, Jake and Daphne, who met at our Sukkot games day, showed up together once, and Jake came another time on his own. El Grande – Eszter and Eitan tied for first with Emily a close second, Gili third. Key Harvest – Gili, Jake, Emily and Eitan started as a team, then Emily took over when Jake left while the game was in progress, the team won. I had a conflict on Wednesday, so we switched to Tuesday. Adam can’t come on Wednesdays, so he came, bringing his gf Valla. First play for Valla, second for Adam. It was perhaps not the easiest of all sets for new players, but there you go. Lots of trashing. Lots of remodeling coppers into Secret Chambers. A few curses gained, but these were also remodeled. Valla had decent cards, but she didn’t use them to gain points until very late. Adam bought two early five cost cards before either of us (Tributes), and also bought the first Province, forgoing his first jump to 8 for a gold. I took City and Council Room, then Tributes. Eventually I had two turns of 16+ with two buys = 2 Provinces. The first one put me ahead of Adam; the second one was pretty much game. On the last turn, Valla finally got a turn like mine, chaining City’s and card drawing. Unfortunately, she played a Swindler. Adam turned over a Province, and he then took the last Province. Valla could only buy a Duchy. Fist play for Nadine and Gili. It took an awfully long time to explain the game, some 45 minutes. They were still going after we had finished both a slow game of Dominion and Settlers of Catan. First play for Valla, and as usual, the new player won. She started off with a strong road that cut the island in two; her Road Building card didn’t hurt there. No one else was going to steal Longest Road from her (at least, not easily). 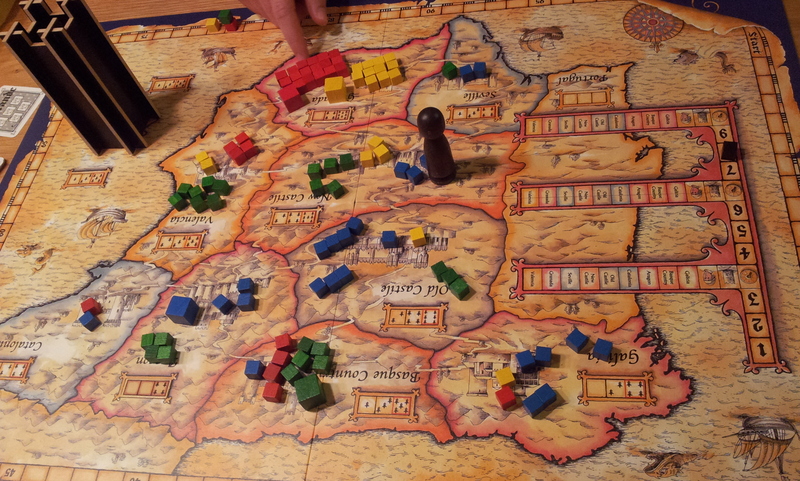 Adam mistakenly places his initial settlements on essentially two resources – wood and wheat – and a 2 ore spot. 2 rolled up a number of times, however, and he reaped his ore.
We play without the curses. Not much to say about the game.